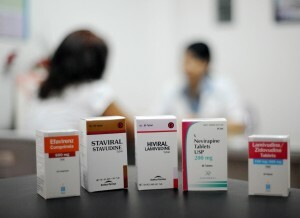 A baby born with HIV, the virus that causes AIDS, appears to have been cured, scientists announced at a meeting on Sunday in Atlanta. They described the case of a child -- as yet unnamed -- from Mississippi who is now 2 1/2. The child has been off medication for about a year and appears to be free of infection. There's no guarantee the child will remain healthy, although sophisticated testing uncovered just traces of the virus' genetic material still lingering. If so, it would mark only the world's second reported cure. Specialists say Sunday's announcement, at a major AIDS meeting in Atlanta, offers promising clues for efforts to eliminate HIV infection in children, especially in AIDS-plagued African countries where too many babies are born with the virus. "You could call this about as close to a cure, if not a cure, that we've seen," Dr. Anthony Fauci of the National Institutes of Health, who is familiar with the findings, told The Associated Press. Here in California, researchers have been electrified by the news. California reported the largest number of HIV diagnoses in the country in 2011, according to the Centers for Disease Control. More than 60 percent of Californians with HIV live in Los Angeles or San Francisco. Dr. Deborah Cohan, an obstetrician at UC San Francisco, who specializes in the care of pregnant women with HIV was at the conference in Atlanta and described to Mina Kim how the discovery might impact her work. "There are many things we have already been doing in San Francisco," Cohan said. "The most important piece is that we've been successful at essentially eliminating HIV transmission to babies. In this case, the baby was infected wiht HIV at birth, and we have been exceptionally successful at preventing that from happening to begin with. The last case of HIV transmission we had in a baby in San Fancisco was in 2004." Mother-to-baby transmissions in the U.S. are fairly uncommon -- about 130 a year. Where this discovery may have significant implications, Cohan says, is in sub-Saharan Africa, where new infections in babies are much more common. "One of the things this points to is the importance of early diagnosis of HIV in babies," Cohan said. "Currently national guidelines considers it optional to do a birth test on an HIV-exposed baby. The national recommendations are that it should be done in the first two weeks of life. In this case, they did a birth testing, and that really had an impact on how they ended up managing the baby because the baby was diagnosed so early." Cohan said this child's case could have an impact on national guidelines and national recommendations. Currently, if a child is HIV positive at birth, the recommendation is a lifetime of antiretroviral medications, which is expensive and come with side effects. "While in general we think these medications are safe, taken over a long period of time and for very early exposure with an HIV-infected baby, certainly there are cumulative toxicities that can occur, so if that can be avoided, certainly that would be an optimal strategy." The only other case of an HIV/AIDS cure is that of Timothy Brown, the so-called Berlin Patient. As a treatment for cancer, he received a bone marrow transplant in Germany from a donor who was genetically resistant to HIV.